The neighborhoods of Brooklyn continue to amaze me. Our last stop there took us to the Bedford St section of Williamsburg. Today the Fan Club and I, along with my extended Brazilian family, decided to head out and pay homage to my restaurateur friends George and Farid, who own the very hip, Bogota' Bistro in Park Slope Brooklyn. I have written about this great little restaurant before ( see this October 2010 post) and wish I could visit more often. the Pan Hispanic grub, at times fusion, at times regionally distinct, never fails to please our palates. So you might wonder, why Brooklyn ? After all, it's has had a bad rap conjuring up images of dangerous inner city war zones and myths of urban survivalism. Well folks, you should know by now, we are not in the seventies anymore, nor are we are we in Kansas. Brooklyn is gentrifying faster than you can say as doppio non fat , no foam latte. Park Slope is one of New York's most desirable places to live. A short hope away from lower Manhattan , historic in its demeanor, Park slope hosts a nice collection of eateries that you will not want to miss. Bogota' Bistro is one of those. Since I last visited my friends, I got a feeling that the restaurant has expanded. The menu seemed slightly enlarged, Certainly , Farid's and George's family has, as they have jointly adopted some beautiful twins. 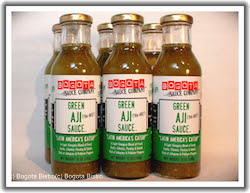 I also noticed that they have started making and selling their own brand of Aji sauces. Take a look at the webstore , and try a few. My favorite is the green aji. Keep it cold in your refrigerator , and break it out when you are looking for something different to flavor your ham sandwich . Want an idea. Try Italian Parma cotto. slicing Asiago , on two thick slices of crusty pan de campagne, splashed with Bogota' green Aji and a few Italian tangy-hot Peperoncini. You won't see this sandwich on the Bogota' menu, but I hope my friends are tuning in for ideas for their next outdoor picnic. We ordered a few dishes including some that are meant for sharing The free plantain chips, with their subtle hint of cumin seasoning, kept our hungry group busy , while waited for our appetizers and listened to a medley of pan Latin music, celebrating many of Central and South America's countries ,and islands. The family enjoyed sharing an impressive Colombian Fritanga platter. Ftitanga is a traditional fried dish made of pork chicharrón, pork chorizo, pork ribs, morcilla (blood sausage), papas criollas, maduros, tostones, great topped Colombian aji sauce. The chicharrón, small pieces of fried pork belly - bacon lovers pay attention - were some of the tastiest that I have ever tried, and really made the dish for me. They were seasoned with cajun-like mix that still sported a South American punch to it. The Patacon Garilic Shrimp, a dish that contained shrimp,warm hearts of palms sauteed in garlic and wine. was In my book the biggest hit. What made this dish extra special that the saute' was placed on top of a toasted and seasoned white corn arepa which soaked some of the sauce, adding new dimensions of flavor and texture to the dish . Folks, this was one of those dishes that I am sure will influence my cooking in the future. I just love it when that happens. Cooking inspiration is not about cookbooks. It's about experiencing the rich diversity of culinary traditions of our friends, of our street vendors, and eateries , from holes-in-the-wall to large banquet halls. Our dinner also included an order of their paella and arroz con pollo. They got both right , and I could see how it hit the spot for the fan club and guests. And of course, dinner would not be complete without of good dessert. Flan was the most popular of the desserts that night but I went for the Churros and chocolate sauce. The dessert was extra special for me. Churros was one of recipes that George ., Farid and I learned about and made while culinary school. At Bogota' Bistro they perfected them. Too bad the fan club was watching me closely , or I would have had seconds. I continue to appreciate Bogota's use of social media. They just get it and I would not be surprised that part of their success is due to the advertisement that flows through their smart and effective use of social media . Good job guys! Now let me hit twitter. Got to let them know about this other short review of their great restaurant.